We have studied many other aspects of this question in Separated Neighbors, Living with Dinosaurs and Major Extinction. We won’t be exploring if dinosaurs are alive today in this article but what we do need to know is if God is right in His Word about dinosaurs. So, the top question is a very important one. What is the problem though with dinosaurs existing so long ago? The following list categorizes just some of the things we would have to accept if we are to say that dinosaurs lived millions of years ago. 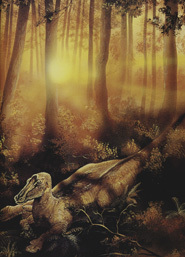 Dinosaur’s Existence – Millions of years ago or recently? Basically, if we can’t trust that dinosaurs were created by God on the sixth day and about 6,000 years ago then we make Him out to be a liar. When we read the Bible we find accounts of humans from Adam –> Abraham –> Israel –> Jesus Christ. We find genealogies in those accounts (for more on genealogies go to Genealogies – Important Lists) and other historical evidence for a young earth. Now, we can sort of backtrack through those genealogies and find that the earth and the universe are only a little over 6,000 years old. Well, since we know that to be true and that God is true in His Word we can easily claim that dinosaurs did not live millions of years ago. But, there is more than just biblical evidence! In 1999 a paleontology student was walking through his uncle’s badlands ranch when he saw three vertebrae. He dug out some of the vertebrae but couldn’t finish because nighttime was setting in. The following weeks this young man dug out the tail of a Hadrosaur identified as a Edmontosaurus. But, the tail itself was not significant, but the fossilized flesh that was found with it! Yes, I did just say fossilized flesh. But, does this deter the evolutionists? Well, they just say that it fossilized 65-67 million years ago! Flesh can not last that long. There are other accounts of fossilized flesh and even fresh flesh that contains red blood cells. The evidence for a young earth is overwhelming!